Incising the “frog pond” inspired tiles. When I was about ten years old, my primary school celebrated its centennial. As part of the celebration, some artists were commissioned to paint a huge mural of outback Australia on one of the external walls of the building. It was exciting to see the artists work, to be exposed to art making and to see the mural take shape. Even though we children were not actively involved in the process of painting the mural, just being bystanders made us feel like we were special, included in a shape-changing activity, sharing a unique moment in time. Without knowing it back then, that moment shaped my future. Children love to make art, however the process of helping children make art for a public space is of necessity a controlled, well thought out exercise. The tiles for the Thirroul Beach playground need to follow a grown up’s brief: they must be flat and even, they need to last a long time, they can’t be difficult to lay or maintain, they must not be slippery or create a trip hazard and they must work aesthetically. 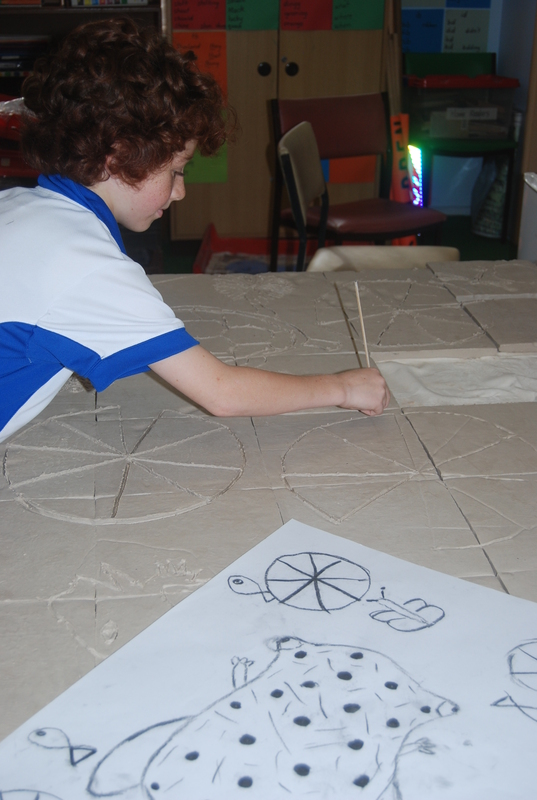 In groups, the children used bamboo skewers to trace over the paper template, leaving the outlines of the design imprinted on the freshly made tiles. 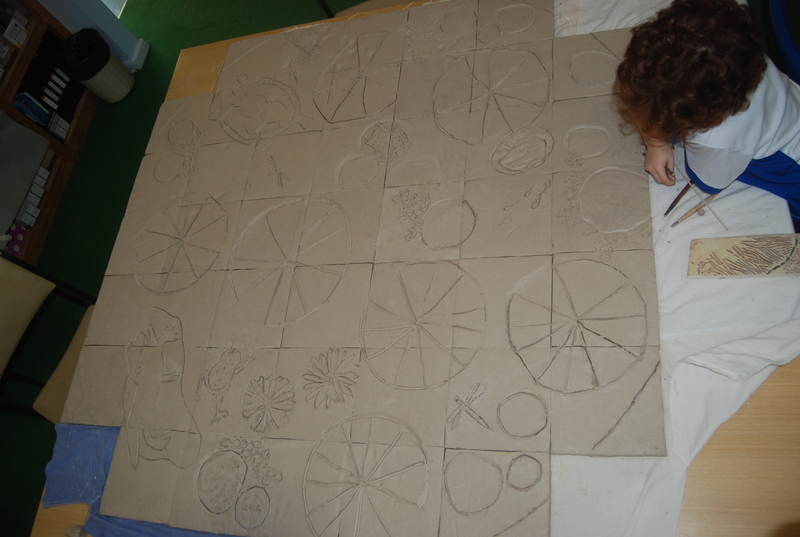 Once the tracing paper was removed, the children carved their drawings into the tiles and when they finished they were packed back up into the bread trays and returned to the studio for final tweaking, colouring and firing. 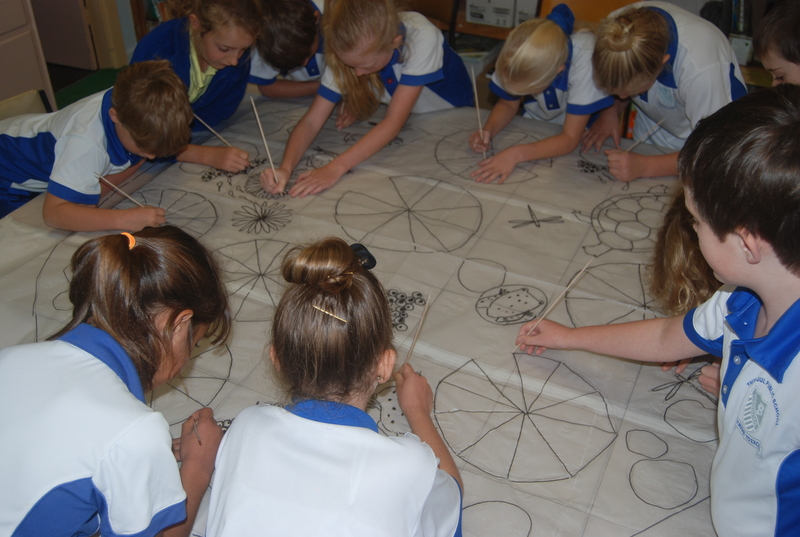 The children of 4B at Thirroul Public school have been involved in a process which is fun, exciting and rewarding. Not just making art for pleasure, these children have helped shape their own local playground. They will experience a rare sense of ownership for a public place. That means more respect for their playground and less vandalism for many years to come. On the way to ballet lessons, I recently passed my old school playground and pointed out the aging mural to my niece and nephew. Thirty five years since the painting was made and a palpable sense of being part of something important continues to resonate for me. That’s a big reason why I’m a public artist. Transferring the “frog pond” design onto the soft tiles. 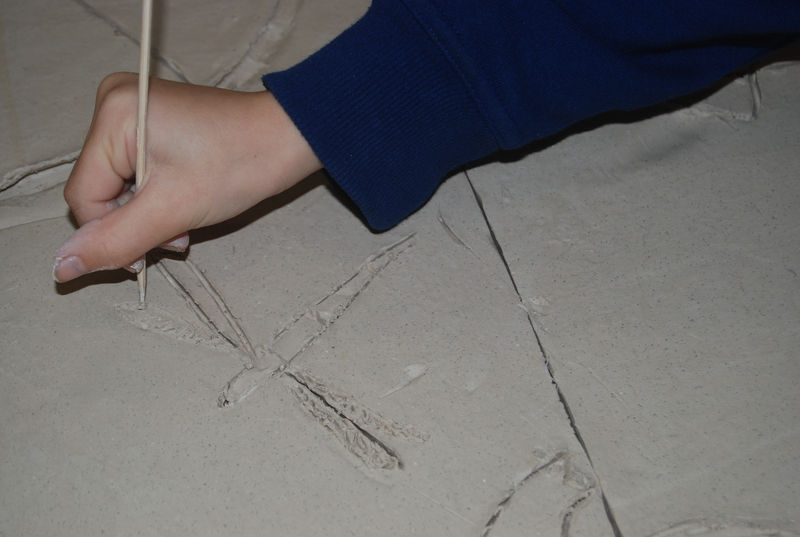 Showing the children how to carefully carve into the clay tiles. The completed “frog pond” ready to return to the studio. Landscape Architect: Jana Osvald, Umbaco Landscape Architects. PreviousChildren Shaping Art, Art Shaping Children, Children Shaping Place. 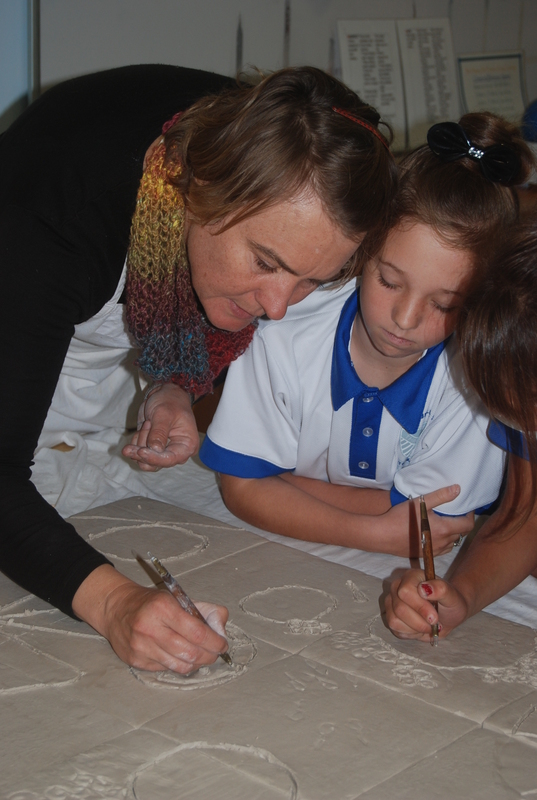 The second of three workshops to produce artworks for a new playground in Thirroul, NSW. I’m finding this really interesting Celeste, what a great project.